Written by Paul Race for Big Indoor Trains™ and LittleGlitterhouses.com. If you like vintage-looking trains and towns, you should enjoy this series of projects, which use inexpensive materials to produce authentic-looking reproductions of classic metal buildings and accessories to go with early tin trains. What is Tinplate? - Long before the age of plastics and stainless steel, sheet steel was used for making containers, toys, and many other objects used in most American and European homes between the mid-1700s and mid-1900s. To slow the steel's corrosion, a layer of molten tin was applied to both sides while the material was still in sheet form. Then stamping plants or tinsmiths would fabricate the "tinplate" into its final form, soldering pieces together when necessary. One of the largest consumers of tinplate has been the canning industry, although tinplate had hundreds of other uses just a century ago. Many popular tinplate toys of the 1800s, especially banks, are collectible today. When toy trains began to be mass-produced, it is no surprise that tinplate was widely used for them as well. Initially, many tinplate trains and accessories used three-dimensional stamping to add detail. However, a few factories discovered that lithograpy, a kind of printing that uses etched stone, could add color and detail at the same time, without having to have the rivets physically milled into the stamp. Later, companies like Marx, trying to hold down costs, discovered that you could use the same basic "stamp" (or shape) to manufacture a dozen different items, just by changing the artwork. Companies that made toy buildings to go with toy trains discovered this even earlier - so a number of companies made several buildings from the same "stamp" just by changing the graphics. Note: Companies like Lionel used tinplate to make their track until fairly recently. So model railroaders call almost any toy trains that were built to run on tinplate track "Tinplate," even if the train's bodies are made of plastic. But we are using the word "tinplate" in its earlier meaning, to describe trains and accessories that are actually made from sheet steel that has been coated with tin, and stamped into shape. Tinplate Reproductions as a Hobby - for years, folks who admired the old tinplate trains and accessories have been not only collecting, but also making their own, trying to use materials similar to those used by the original manufacturers. In early 2009, project designer Howard Lamey began dabbling with making his own tinplate train cars, modeled after the O gauge Marx lithographed cars of the 1930s and '40s. One principle he discovered was that many Marx cars had exactly the same body - they just had different lithography. In fact, some folks were providing "wraps", labels that could be cut and glued to old Marx bodies that were damaged too much to restore. Howard's experiences reminded me of something I had thought about long ago and done nothing about - the notion of using modern computer graphics to create reproductions of the lithographed-style buildings that accompanied many tinplate railroads over the years. So I collected as many photographs as I could find of early 1900s-era stations and other structures. I had always liked the American Flyer Hyde Park Station, on which our first joint project was based. While I was creating the graphics for that project, Howard created the Watchman's Shanty project on his own, and we both liked the results so much that we decided that we had to make it a series. Building a Vintage Cape Cod House - An easy, but charming "Tribute To Tinplate" structure that looks great with our other projects but will stand fine on its own as well. Includes free plans, graphics, and instructions. Click on the photo for more information. Building a Vintage "Lithographed" Station" - the first article in our "Tribute to Tinplate" series, based on a prewar American Flyer standard-gauge station. Includes free, downloadable graphics, plans, and instructions for modeling in O/S and Large Scale/Standard Gauge. Building a Vintage Tin-Style Cottage - This project is inspired by a popular pre-war tinplate house that was made to go with standard gauge trains, like the early 1900s-era Ives and Lionel. Paul Race's commercial-quality graphics, as well as Howard Lamey's plans and assembly details are all free, to give your railroad a vintage tinplate look with a few cents' worth of materials. Many options are available, and most graphics and plans can be downloaded directly from the article. Building TinPlate-Syle Store Fronts - Expanding our Tribute to Tinplate(tm) community is a set of down-town-style store fronts inspired by a series of tinplate candy containers that were made in the early -to-mid 1900s by West Brothers. The original containers were pretty small, but we've redrawn the graphics in larger scales and added a bit of additional detail so they'll fit into any tinplate or faux-tinplate setting. New May, 2010! Building Seaside Store Fronts - Building (Tinplate-Style) Seaside Storefronts - The latest addition to a new favorite. Sticking with the West Brothers outline, we have replaced the brick and stone with clapboard painted in the colors and themes that brighten coastal towns on both coasts. Colors are compatible with Howard Lamey's Sandy Shores beach-inspired collection. New June, 2010! Building Flag City Store Fronts - Building (Tinplate-Style) Flag City Storefronts - A seasonal tribute to our national heritage, complete with free downloadable plans, graphics, and instructions to bring some red, white, and blue to a tinplate railroad, display village, or mantel top near you. 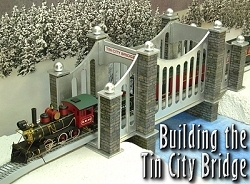 Building the Tin City Bridge - Add an eye-popping feature based on the classic Lionel Standard Gauge bridges. 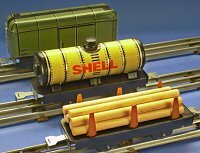 Works great with collectible villages, vintage O and S-gauge trains, On30 trains and more! Free downloadable plans, graphic files, and step-by-step instructions are provided. New, December, 2009! Building a Lithographed Switch Tower - Switch towers used to be among the most common North American railroad structures. They were located in large switchyards so that switch operators could see the turnouts and - in many cases - operate them remotely. Consider them the "control towers" of the railroad, as it were. When tinplate trains were in vogue, tinplate models of these structures were also available. This easy, inexpensive project pays "tribute" to both the golden age of railroads and the golden age of toy trains. Free downloadable plans and graphics are provided, along with detailed instructions. New, December, 2009! Building a Vintage-Style Diner - Near most busy rail stations stood a diner inspired by the efficient, familiar railroad dining car. Folks coming and going knew they could "nip in" for a quick cup of "Joe" or "drop in" for a home-style meal with all the "fixin's." This project is about the same size as Howard's tinplate Marx coaches, but graphics for bigger versions are available. To get the most "tinplatey" effect possible, Howard used a real steel roof, converted from half of an old eyeglasses case. But even if you don't have that particular resource, this is a great project. Building Tinplate-Inspired Goose-Neck Lamp Posts - Add even more vintage variety to your tinplate-inspired communities, for less than $1 each worth of materials. Free downloadable instructions are provided. Building a Tinplate-Inspired Watchman's Shanty - Back in the day before automated crossings, these were common sites alongside busy rail crossings. Howard's exclusive design pays tribute to a series of tinplate structures that go back a hundred years and include three different scales. 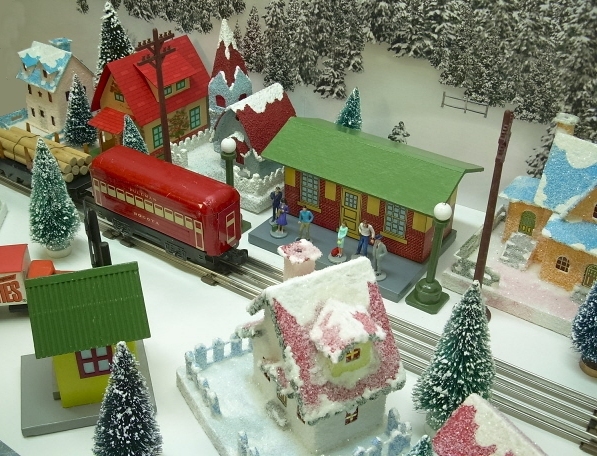 His free plans and instructions will help you dress up any indoor railroad or holiday village. Building a Tinplate-Inspired Lamp Post - The ideal accessory for the Lewis Park Station, or any station or city hall on your railroad or holiday village. No, they don't actually light, but they are cheap and easy to build and add a great deal of vintage interest to any setting. Free downloadable plans are available in several scales. New Feature - Building a Tinplate-Inspired Railroad Crossing Sign - This is the ideal accessory for the Watchman's Shanty project. Based on a series of products that are now available only as expensive collector's items, this easy and almost-free project will add texture, interest, and period to any model railroad or holiday village. Water Tower with Vintage Lithograph Option - Our Spook Hill™ water tower has a new look - well, an old look. With new lithograph-inspired graphics, this one-time Halloween project adds a vintage appearance to any indoor railroad or display village. The core structure is the same, so if you've built one, it's even easier to build the second. New, free, downloadable graphics for two scales are included. These free downloadable patterns from Paul Race's BigIndoorTrains.com site supplement many of the projects above and help you create our own seasonal or tinplate-style projects. This section includes brick, shingle, siding, door and window patterns inspired by the tinplate buildings that Lionel and other companies made to go with their toy trains a century ago. 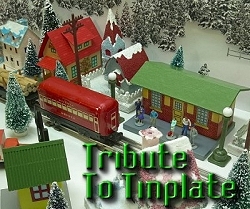 Many of these have already been used in our Tribute to Tinplate(tm) series, which has been embraced by toy train buffs. The Tinplate Textures page provides most patterns in three different scales to help you find the best sizes for your existing railroad or holiday village. If you want to design your own buildings for a Christmas railroad or village, check out this brand-new addition - roof and wall patterns for making your own holiday-themed structures. The Christmas Building Textures page includes brick, siding, and roofing tile patterns in colors that are ideal for Christmas and other midwinter decorating. 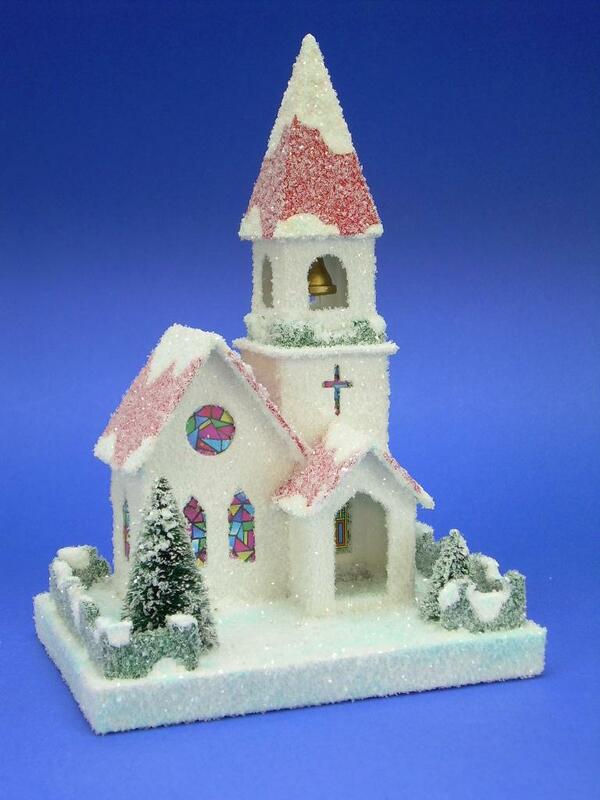 Patterns are available in three scales for all of your "big train" and Christmas village needs. If you want to design your own buildings for a fall or Halloween village, check out this brand-new addition - roof and wall patterns for making your own seasonal structures. The Halloween and Fall Textures page includes brick, siding, and roofing tile patterns in colors that are ideal for fall decorating. Note: LittleGlitterHouses.com(tm), Spook Hill(tm), and Sandy Shores(tm) are trademarks of Howard Lamey. Big Indoor Trains(tm), Big Train Store(tm), Family Garden Trains(tm), Big Christmas Trains(tm), Garden Train Store(tm), and Trains and Towns(tm) are trademarks of Breakthrough Communications (www.btcomm.com). All content on this page is (c) Copyright by Paul D. Race and Breakthrough Communications. Reuse or republication without prior written permission is specifically forbidden.